Hoffman Equipment is expanding its retail territory in the Northeast United States. The Piscataway, New Jersey-based dealer is purchasing Penn-Jersey Machinery’s assets and will start selling Volvo Construction Equipment (Volvo CE) products for the first time. The deal was completed November 19. Hoffman is taking over Volvo CE distribution in the territories previously covered by Penn-Jersey Machinery and Malvese Equipment. 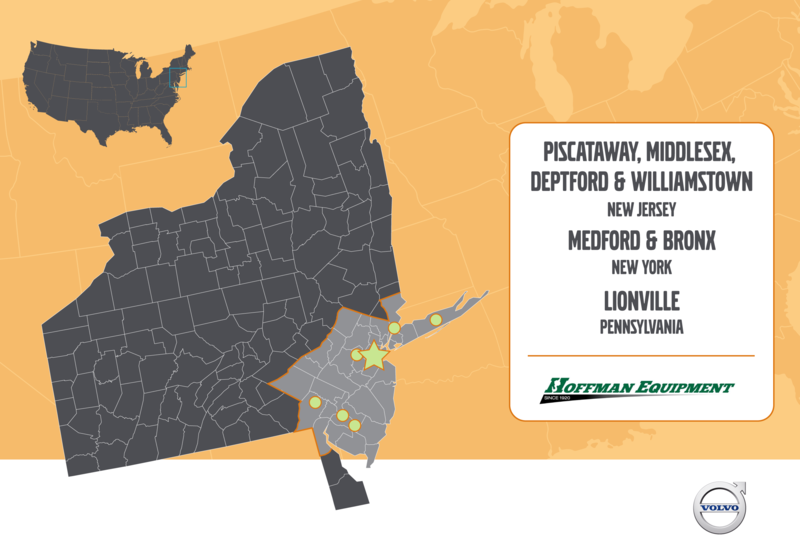 Hoffman will assume Penn-Jersey Machinery’s three locations — Deptford and Middlesex, New Jersey, and Lionville, Pennsylvania – which add to Hoffman’s existing locations in New Jersey and New York. To ensure a smooth transition for Volvo CE customers, all current Penn-Jersey staff will be offered employment within the new Hoffman locations. “Hoffman is a great example of the distribution partner that our customers want to deal with. It has built strong relationships with its customers and knows the specific needs and preferences of the region very well. We’re excited about this partnership,” Roy commented. “Hoffman will play a key role in helping us achieve our strategic goals in North America: to be a unique solution provider while ensuring the highest uptime in the industry”. For more info on Volvo, click this link. Hurry! Before it’s too late!